Moving is expensive enough, considering the cost of renting a truck and fuel, opt for recycled moving boxes so the environment doesn't have to pay, too. There's no reason for perfectly good boxes to end up in the landfill or for more trees to be cut down to make new ones when boxes can be reused or recycled, . When it comes to repurposed boxes, you have a couple of options: purchase boxes made from recycled materials or reuse standard cardboard boxes. Your choice may depend on your moving budget or the availability of boxes. Flatten and save boxes each time you move so you can reuse them next time. They can easily be stored in the back of the closet, under your bed or in the garage when not in use. You may not be able to save every single one, but saving a few is better than starting from scratch next time you move. Ask friends who have recently moved to save their leftover boxes. Be sure to pass the favor on to other friends when you are finished moving. Collect boxes from local stores such as grocery stores and liquor stores. Determine when they receive shipments and pay a visit then before the boxes are thrown out. Be sure to check with the store manager before helping yourself to the boxes. Sometimes stores have recycling contracts for their boxes or may have promised them to someone else. Scavenge dumpsters or trash on the street. This is obviously not pleasant, and may get you in trouble, so proceed at your own risk. Scour Craigslist for free or cheap used boxes, or websites like Moving Box Exchange that connect those in need with those in possession. If you want to skip cardboard boxes altogether, consider renting durable plastic moving crates. They stack much easier than flimsy, large cardboard boxes and can be reused many times over. It takes some time to gather enough boxes to pack all of your belongings, and many stores won't just give them away. Often used boxes are damaged or covered in packing tape. If you must purchase boxes, one option is to go to your local moving supply store or large office supply chain like Staples and buy brand new boxes. Be sure to look for boxes that contain recycled content. However, the percentage of recycled content versus raw material is often low, and lot of energy is involved in recycling cardboard that otherwise still has some use left in it. 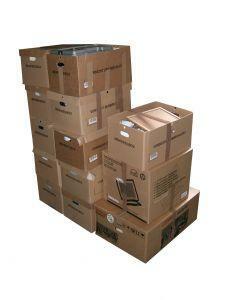 A better option is to purchase previously used boxes in bulk to accommodate your entire move. There are several websites that provide this service for low prices. You may purchase a few boxes or a thousand in a variety of sizes. EcoBox even provides custom-sized solutions for packing special items. Boxes will be shipped directly to your door, and are pretty affordable; small boxes only cost a dollar. Similar to EcoBox, Used Cardboard Boxes rescues stacks and stacks of boxes from companies that no longer need them. Boxes that are still in good shape are packed together in kits available for purchase online. Any boxes that don't meet quality guidelines are recycled. Shipping is free and only takes a couple of days. Don't waste your money on brand new cardboard boxes, or natural resources that are used in the manufacturing of new ones. Whether you purchase recycled moving boxes or reuse some that would otherwise have been discarded, you can rest assured that you're doing your part to improve the environment.